Sat 15-Dec-2018 LNWRS & SRS Joint Christmas Event, Kenilworth Study Centre. Wed 21-Nov-2018 LNWRS Research Open Day, Kenilworth Study Centre. Sat 10-Nov-2018 LNWRS Research Open Day, Kenilworth Study Centre. Sat 03-Nov-2018 SRS Research Open Day, Kenilworth Study Centre. Sat 20-Oct-2018 LNWRS Research Open Day, Kenilworth Study Centre. Wed 10-Oct-2018 LNWRS Research Open Day, Kenilworth Study Centre. Sat 29-Sep-2018 LNWRS Research Open Day, Kenilworth Study Centre. Sat 15-Sep-2018 SRS Research Open Day, Kenilworth Study Centre. Wed 05-Sep-2018 LNWRS Research Open Day, Kenilworth Study Centre. Sat 21-Jul-2018 Research Open Day - Joint LNWR and Signalling Record Societies. Sat 23-Jun-2018 Research Open Day, Kenilworth Study Centre. Sat 26-May-2018 'At Home' Francis Pearce, North Yorkshire. See Newsletter for details. Sat 19-May-2018 Research Open Day - Joint LNWR and Signalling Record Societies. Wed 09-May-2018 Research Open Day, Kenilworth Study Centre. Sat 14-Apr-2018 Research Open Day, Kenilworth Study Centre. Sat 24-Mar-2018 Research Open Day - Joint LNWR and Signalling Record Societies. Wed 07-Mar-2018 Research Open Day, Kenilworth Study Centre. Sat 17-Feb-2018 Research Open Day, Kenilworth Study Centre. Sat 27-Jan-2018 Research Open Day - Joint LNWR and Signalling Record Societies. Sat 11-Nov-2017 Research Open Day - Joint LNWR and Signalling Record Societies. Sat 28-Oct-2017 LNWR Society Special General Meeting. Crewe Arms Hotel. Sat 21-Oct-2017 Research Open Day, Kenilworth Study Centre. Wed 04-Oct-2017 Research Open Day, Kenilworth Study Centre. Wed 06-Sep-2017 Research Open Day, Kenilworth Study Centre. Sat 15-Jul-2017 Research Open Day, Kenilworth Study Centre. Sat 24-Jun-2017 Research Open Day, Kenilworth Study Centre. Wed 07-Jun-2017 Research Open Day, Kenilworth Study Centre. Sat 20-May-2017 Research Open Day, Kenilworth Study Centre. Wed 12-Apr-2017 Research Open Day, Kenilworth Study Centre. Sat 18-Mar-2017 Research Open Day, Kenilworth Study Centre. Wed 08-Mar-2017 Research Open Day, Kenilworth Study Centre. Sat 25-Feb-2017 Research Open Day, Kenilworth Study Centre. Sat 28-Jan-2017 Research Open Day, Kenilworth Study Centre. Society stand attending the Midlands Model Engineering Exhibition at the Warwickshire Exhibition Centre, The Fosse, Fosse Way, Near Leamington Spa, Warwickshire. Talks, Photographs, Information, Nameplates, Memorabilia, Artefacts, Plans, Drawings, Photographs, Models, Paintings, Jack Nelson Dioramas, Preservation, Restoration, New Build Projects. Click HERE for a PDF leaflet giving full details of the days events and stands. Cruise on Tug/Tender Daniel Adamson. 5 hours duration, from Ellesmere Port, includes all of Garston Docks. This event will be held at the Study Centre on Saturday 7th July 2018. Come along and meet fellow modellers, discuss techniques of building models of locomotives, rolling stock, buildings, to name but a few, with different materials, painting them and indeed, all aspects of the hobby. There will also be models on display to provide even more inspiration! This year Roger Stapleton will be giving a talk on the development of LNWR locomotive from K's first offering to the present day. If you would like to do so, please feel free to bring along examples of your own work, finished or under construction, other members are bound to be interested. Perhaps you have a kit that has been sat on the shelf with a problem you can�t just solve, but another member may be able to help you with. Test tracks in 00, EM, P4 and O gauge should be available on the day (and also in gauge 1 if a member attending works in this scale, could you please bring a couple of lengths of track along). Modellers of all gauges, disciplines and skill levels are all very welcome. Tea, coffee and biscuits will be available, but please bring along your own lunch, or utilise the local facilities. LNWR Society Annual General Meeting. Crewe Arms Hotel, Nantwich Road, Crewe CW2 6DN. Tea, coffee at 10:00 am with meeting start at 11:30 am. Hotel car park users must register at Reception to avoid a penalty fine. Talks, Photographs, Information, Nameplates, Memorabilia, Artefacts, Plans, Drawings, Photographs, Models, Paintings, Jack Nelson Dioramas, Preservation, Restoration, New build Projects. Gauge 1 model railway track in the station concourse. Bring your gauge 1 live steam and battery electric locos and run them on it. Gauge 0 test track upstairs in the goods shed. Bring your gauge 0 locos and run them on it. Modellers of all gauges, scales and skill levels are called to this event at the Society Study Centre at Kenilworth on the 1st July, with the centre open 10am -5pm, but please feel free to come in at any time during this day, attendance between 10 and 5 is not mandatory. The event speaker Peter Chatham will reminisce around 11am about the PC Models business he used to run, and particularly the range of carriage kits that he developed, and will be bringing along the prototype and mock up units that he has, to show how this still very much sought after range of carriages were produced. Please feel free to bring along examples of your own work in any scale or gauge to display, whether complete or still being built. Lunch followed by talk (Speaker/Topic TBA) at Talbot Inn Stone. Talk on history of an LNWR line in the West Midlands. More details in March Newsletter. Brunswick Hotel, adjacent to Derby Midland Station. Host Peter Stanton. Lunch in the 'Talbot Inn', , followed by a talk and discussion on '19th/20th Century industrialists and their influence and responsibilities to their communities, particularly Crewe�. Sun 27-Nov-2016 Society stand at Warley NEC, Help wanted Urgently. The Warley model railway show at the NEC on Nov 26 & 27 is probably the largest in the UK and this year the LNWR will be well represented by two superb layouts - 'London Road' and 'Clarendon'. The Society, at short notice, has been given display space so there is an opportunity to publicise the Society, sell some literature and recruit new members. Steve Johns will be manning our stand on both days but we need people to assist him. Please put your name forward now - the good news is that four volunteers on both days get into the exhibition for FREE. Any assistance you can give will be greatly appreciated. Steve Johns can be contacted at: steve9617@hotmail.co.uk or by phone on 07870789996 or contact me here today on 0191 4171003. Can also contact Webb Master via link below who will forward your reply. 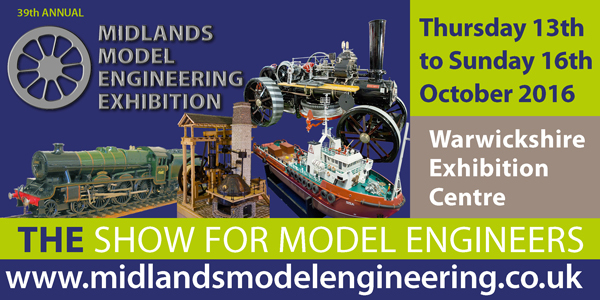 This year to be hosted by Leyland and District Society of Model Engineers at Worden Park, Leyland Lancs. Click HERE for a PDF leaflet giving full details of the event. Midlands Area Members Day and Social Event Kenilworth. Contact Mike Hollick. See details in June Newsletter Page 3. Tue 31-Jan-2017 150th anniversary of the SMJ - Towcester Museum. 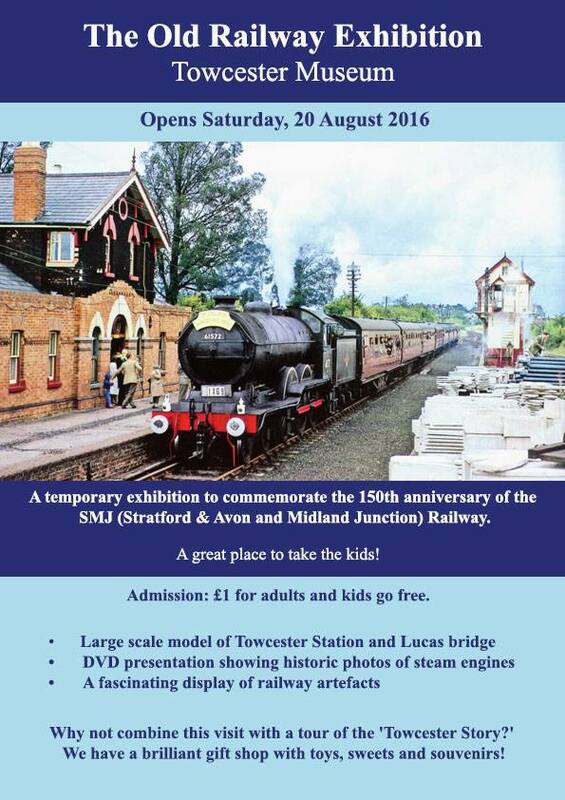 exhibition 'The Old Railway' which commemorate the 150th anniversary of the SMJ. See leaflet for details. Talks, Photographs, Information, Nameplates, Memorabilia, Artefacts, Plans, Drawings, Photographs, Models, Paintings, Jack Nelson Dioramas, Preservation, Restoration, New�build Projects. This event will be held at the Study Centre on Saturday 2nd July 2016. Come along and meet fellow modellers, discuss techniques of building models of locomotives, rolling stock, buildings, to name but a few, with different materials, painting them and indeed, all aspects of the hobby. There will also be models on display to provide even more inspiration! This year there will be a demonstration of how to paint and line out a coach in LNWR livery by Paul from Stevenson Coaches. This is a rare opportunity to sit down with a professional painter and be shown this aspect of the hobby which many modellers find difficult. Paul will also have his range of 4mm LNWR coach kits and accessories with him and available for purchase on the day. If you would like to do so, please feel free to bring along examples of your own work, finished or under construction, other members are bound to be interested. Perhaps you have a kit that has been sat on the shelf with a problem you can�t just solve, but another member may be able to help you with. The Society 2015 AGM will be held on Saturday 4th June at the Crewe Arms Hotel, Nantwich Road, Crewe, CW2 6DN. Please note that the meeting will start at 11.30 am. Tea/coffee and biscuits will be served at 10:00 am. Members are welcome to bring guests. Parking is available at the Hotel (please notify reception on arrival otherwise you will be charged). For further details see the notice sheet posted with the March newsletter. 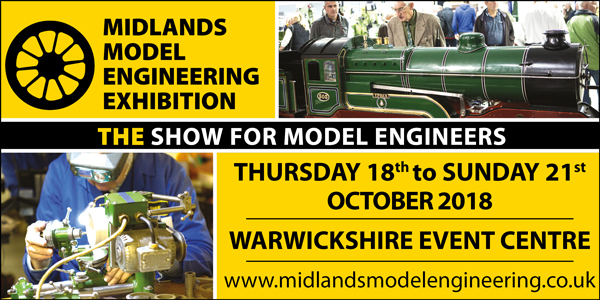 There will be an LNWR Stand at the 23rd National Model Engineering and Models Exhibition Doncaster Racecourse. Members please come and say hello, Non-Members please come and join ! Roger Stapleton would appreciate help from members in manning the stand at Scalefour North model railway exhibition in Wakefield. Jol Wilkinson will be there with his magnificent LNWR layout 'London Road' as will John Redrup with the London Road Models trade stand. Meeting Room. Stone Station. Staffs. A joint meeting at the above venue with the George V New Build Group is being held at 14.00 hrs which will include a photographic presentation by Norman Lee of George V locomotives in operation both in L&NWR and LM&SR days, and which will permit discussion and observation of their operation and capabilities. This will followed by a presentation by Paul Hibberd and Tom Mainprize of progress with the building of 'Prince George'. Again there will be opportunities to ask questions relating to the construction. It is hoped that the engineer, Jamie Whyte will be able to attend. The afternoon will finish about 17.00. Prior to the meeting, members, supporters and visitors will be welcome to attend a gathering in the Talbot Hotel from 12.00 noon for a beer and food. The menu may be limited to sandwiches and a main course like Scampi or Sausage and chips. Participants will help catering at the pub if they can advise the Chairman beforehand that they wish to participate.